This is a very simple way to demonstrate and actually see a chemical reaction unfold before your very eyes, combining liquids and a solid to create a gas! There are a lot of versions of this demo online – I chose to follow Science Bob’s version. First, you pour 1/4 cup of water (warm, if possible) into a Ziploc bag. Next, you add 1/2 cup of distilled white vinegar to the bag. That’s all of our liquids. You then put 3 teaspoons of baking soda onto the center of a paper towel square (about the size of your palm), and fold it up into a little packet. You drop the baking soda packet into the bag, zip it closed as quickly as possible, and then watch the resulting reaction. All scientists in our group ended up with very firm “pillows” composed mostly of carbon dioxide gas – none of them exploded. If we were to repeat this experiment, I would probably use the kind of zip-closed bags that are just a closing seam (no zipper) since I think there was a small continuous leak of gas through the actual area where the zipper was positioned. You simply put a small amount of water in the film canister (fill it about 1/3 full), add 1/2 to a full tablet of Alka-Seltzer, firmly put the cap back on the container, put it lid-side down on a flat surface (preferably outdoors), and then stand back and wait for the reaction. 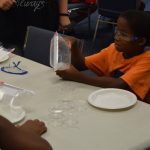 The Alka-Seltzer reacts with the water and releases carbon dioxide. When the carbon dioxide expands so much that it no longer fits inside the sealed film canister, the canister blows apart and it shoots straight up into the air. 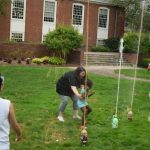 Here is a fun video of Science Bob’s guest appearance on the Jimmy Kimel show…with film canister rockets galore! 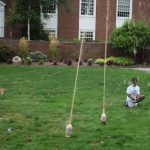 You can find instructions for this demonstration all over the internet, but I always prefer getting my advice directly from Steve Spangler when possible 🙂 And while a handy Mentos Geyser Tube makes this demonstration very easy to complete, you can also create your own tube by simply rolling a piece of paper (wide enough to hold a stack of Mentos candies). 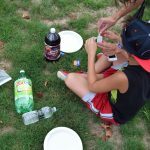 If you choose to create your own tube, make sure you also have a piece of firmer paper or cardboard beneath the tube that you can then pull out to release the Mentos and drop them into the soda when you’re ready to go. Also, while this experiment can work using various types of soda, the hands-down favorite appears to be diet name-brand sodas. There are various theories for why diet coke is a champion product, but using a diet soda is definitely preferred since there is less sugar in the soda and thus less sticky mess after the eruption🙂 Our SEC scientists tested a variety of diet sodas – from name brands like Diet Coke, Diet Pepsi, and Diet 7-Up to store brands of similar sodas. Based on the results of our geysers, the name brands definitely produced the highest geysers – our wimpiest geyser was a store brand diet creme soda. 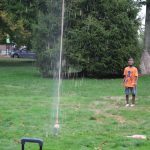 Why do Mentos candies create a soda geyser? When the Mentos are dropped into the soda, the hard coating on the candies helps to break apart the water molecule bonds that surround the carbon dioxide molecules…which allows the carbon dioxide to expand dramatically, and very quickly. Hence, the soda geyser eruption. Interestingly, this demonstration first became popular in the 1980’s when teachers and educators used wintergreen Lifesavers candies for the same reaction. But along the way, the makers of these Lifesavers slightly altered the size, making the candies a smidgen larger…and they no longer could simply be dropped into the mouth of a soda bottle. 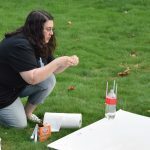 A focused search led educators to Mentos candies – the perfect size AND capable of creating the same dramatic soda geysers. 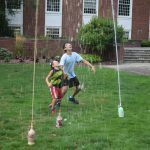 This entry was posted in Science Explorers Club and tagged chemical reactions, film canisters, geysers, Mentos, rockets on August 31, 2016 .